Northeastern Pennsylvania’s Pocono Mountains have been welcoming skiers in droves since the 1950s, and today the region continues to attract urbanites, families, and avid outdoor lovers alike. Whether you’re a city-dwelling newbie, an expert skier, or terrain park-obsessed teen, there’s a Pocono Mountains resort for you. Want to find out which mountain fits you best? Take a look and discover your match. 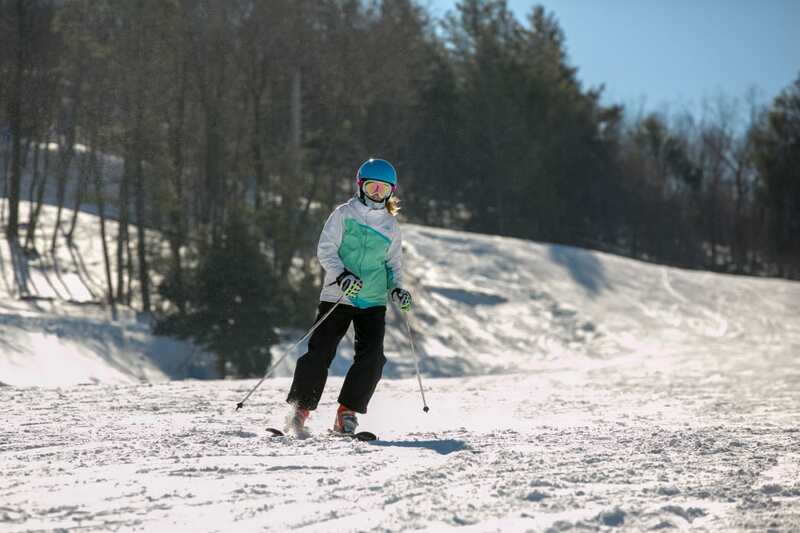 Tucked in the heart of the Pocono Mountains, just two hours from the hustle and bustle of Manhattan, you’ll find Shawnee Mountain Ski Area. The mountain’s 23 trails boast a 700-foot vertical drop with snowmaking on every trail for great groomed skiing all season long. The family-friendly resort has terrain for everyone from beginners to experts, and teens looking to perfect their slides and grabs will love the mountain’s two terrain parks. When the sun sets, keep skiing on the lighted slopes or take a slide on the six tubing hills that are open into the night. High-speed detachable lifts at Blue Mountain let you maximize your ski day. Just 90 minutes from Philadelphia, Blue Mountain Resort boasts Pennsylvania’s biggest vertical drop, meaning fans of steeps will find plenty to love. Razor’s Edge, a 3,000-foot black diamond, offers a challenge for skilled skiers, and there are plenty of moguls, glades, and terrain parks to explore. But that doesn’t mean Blue is just for the pros. Thirty-nine trails offer long runs spread over 16 lifts, and the region’s largest swath of beginner terrain allows newbies to gain confidence without getting in over their heads. High-speed detachable lifts let you ski down and ride up fast so you can maximize your ski day. Prefer the night shift? Blue Mountain offers after-work riding on 30 lighted trails. Then it’s a quick jaunt to be back in the city—no overnight hotel stay required. Ski Big Bear at Masthope Mountain is uniquely built with the base lodge at the top—so you can technically take your first run without riding a chairlift. Learning to ski or snowboard can be tough whether you’re five or 50, but Big Bear’s popular private lessons make it easier. Begin simply by learning how to put on your equipment, start and stop, and glide on the snow. From here you can progress to the lifts. Chairlifts can be intimidating for first-timers, so at Big Bear you’ll start with a ride on the Magic Carpet surface lift to reach the top without your feet leave the ground. Ski to the bottom of Snowbird Trail then ride the sliding sidewalk back to the top. As you progress, take the easier Little Bear Chair before moving onto more advanced trails. Big Bear’s variety of terrain allows you to gain confidence on easier trails while more experienced friends take on advanced runs. Jack Frost is known for its groomed skiing and family-friendly riding. Jack Frost/Big Boulder is not one resort, but two co-owned, separate ski areas that offer very different ski experiences. Jack Frost Mountain leans toward groomed skiing and family-friendly riding while Big Boulder caters to snowboarders and terrain park riders. The ease of terrain makes Jack Frost an ideal place for kids to learn, and tickets for tots under six are just $10. For fun, structured learning, enroll your little ones ages three to 12 in the SnowMonsters Program. 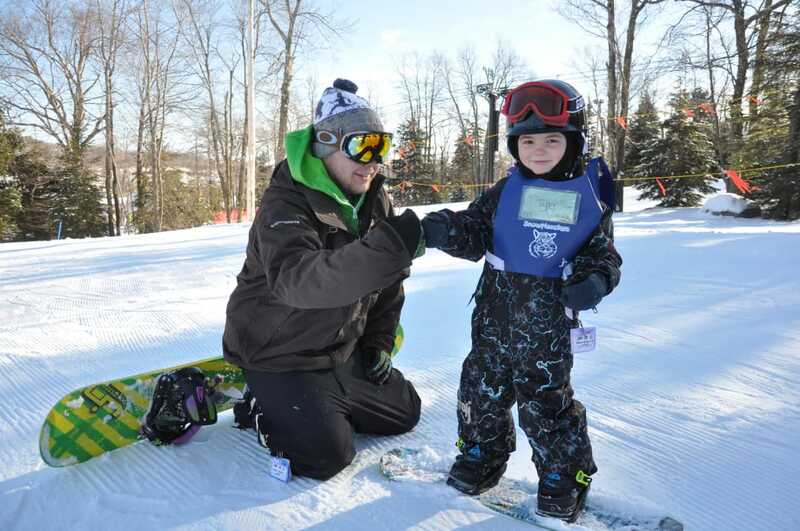 These three-hour supervised sessions teach kids everything from chairlift riding to stopping and turning. Once they’ve got the basics, let them practice in Jack Frost’s beginner area before stepping it up to Blue Square groomer cruiser runs. When it’s break time, find kid-friendly ski fare like chicken fingers, fries, and pizza in the main lodge at the top of the resort. The Tannenbaum Park at Big Boulder offers entry-level rails, rollers, berms, and boxes. Whether you’re mastering your McTwist or perfecting your box jumps, Big Boulder Ski Area is the place to take your riding to the next level. 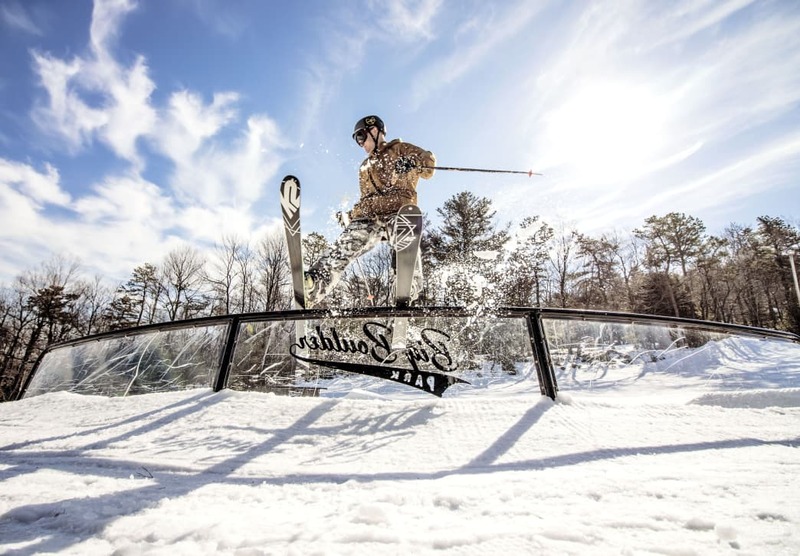 The resort’s known on the east coast for its freestyle terrain and snowboarding crowds, as well as being home to the Poconos’ largest terrain park system. Terrain parks cover 50 percent of the slopes, and features are built and rebuilt throughout the season. The Tannenbaum Park offers entry-level rails, rollers, berms, and boxes where beginners can gain skills with less risk. For bigger rewards, step up to Love Park’s big jumps, tubes, and bars, or strut your stuff on Big Boulder Park’s giant jibs and the region’s biggest triple line. Claiming the title of the Poconos’ largest ski resort, Camelback Mountain has plenty of space for all skill levels to roam, and it is less than two hours from both New York City and Philadelphia. With an 800-foot drop, Camelback spreads advanced runs across the width of the mountain. Snowmaking on 100 percent of Camelback’s 166 acres assures good coverage on the resort’s 38 trails, which are all lighted for night skiing. On powder days or holiday weekends, opt for the slower double and triple chairs to skip the lines and get straight to the fresh terrain. Black and double black diamond runs account for 35 percent of Camelback’s terrain, so you’ll have no trouble finding trails to challenge you. The mountain’s ski school is great for kids and other beginner’s in your group, and will give you some free time to explore the slopes on your own. If you can’t get enough of the snow, stay after dark for night skiing and Galactic Tubing. See what&apos;s taking place this winter season. Browse a full list of events.